Situated in the heart of the bush veld approximately 450 km from Johannesburg, we provide an ideal setting for relaxation in the bush veld. We offer perfect tranquility, superb accommodation and exquisite cuisine to make your stay with us a memorable experience. Your caring host and hospitality team have been chosen for their attention to finer detail, sharing their knowledge and experience with you and providing you with the luxury of a personalized service to make you feel at home and relaxed. Grand Kruger Lodge sleeps 44 guests in 8 rooms and 6 units in the Bush Camp Chalets, allowing maximum privacy and attention at all times. The accommodation in Grand Kruger Lodge has been designed with comfort in mind, despite the fact that guests spend most of the time outside. 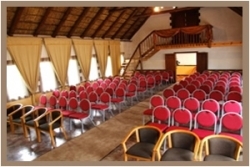 Grand Kruger Lodge is the perfect venue to host your wedding ceremony and wedding reception. A South African Safari Wedding will be a unique way to celebrate your special day. We will cater for all your requirements, the staff at Grand Kruger Lodge will coordinate your wedding day, leaving you to free and enjoy a stress free day. We will organize the chapel, the priest, wedding music, entertainment and reception. We will arrange your flowers and table settings to suit your wedding theme. Our wedding chapel has been specifically designed to provide the perfect setting for your ceremony and can seat up to 120 guests. Our wedding reception area overlooks the low-veld bush and can seat up to 80 guests.